Inside each one of these mildly peanut butter flavored cookies is a gooey surprise. I’ve attempted to perfect their texture by creaming the viscous peanut butter mixture in a food processor, before transferring to a stand mixer for the final addition of flour. If you don’t have a food processor you can do everything in a stand mixer, just make sure you spend some extra time creaming the butter, peanut butter, and sugars together. This dough does require some chilling. I thought I’d warn you before you got started. 1. In a food processor, process together the butter, peanut butter, granulated sugar, brown sugar, salt, and vanilla extract until fluffy. Scrap the bowl down as needed. Add the eggs and baking soda and pulse to combine. 2. Transfer to a stand mixer, add the flour and beat until just incorporated. Don’t over mix. 3. Wrap the dough in wax paper and store in a covered container. Refrigerate for 2 hours or more before baking. 4. Preheat oven to 350 degrees. Cover cookie sheets with parchment paper. 5. Unwrap 52 mini Snickers bars. Then with a standard cookie scoop (size 50), scoop the dough into your hand. Press the dough together and flatten. Place a Snickers bar in the center of the dough and push the dough around to seal. 6. Place 2 inches apart on cookie sheets and bake for about 12 minutes. Let the cookies rest on the baking sheets for 5 minutes before removing to cooling racks. 1. If your Snickers are not super fresh, try smashing them down a little before pressing in the dough so a tell tale candy bar mark doesn't show through. Or even better you can very lightly press the cookies with the flat bottom of a glass right after they come out of the oven. 2. If your dough is too crumbly try spritzing your hands with a bit of water to moisten the dough as you roll each ball of dough. Laura, this is a splendid idea. Why didn't I think of it? This cookies look really good. Thank-you Mary. I hope you like these one. These cookies look like heaven! Thank you for the recipe! I love good cookie recipes! These are everywhere..lol..i wish i felt better, would make them right now! My goodness, how many people do you feed every day? I can't believe the number of posts you make. ButterYum these ones went to my husband's work thank goodness lol. I make cookies for him to take once a week. These are such a GREAT idea!!! These look wonderful. 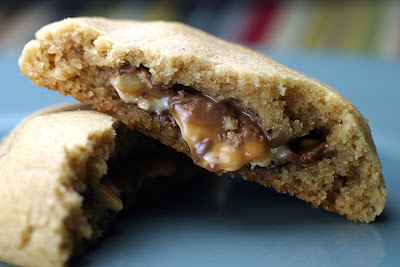 I'm a cookie afficionado, as well as a Snicker's fan, so I'm definitely going to be making these. Love your blog too... will be adding it to my extensive blogroll if that's ok w/ you. You'll be my first blog from Idaho!! Of course I'd love to be added RecipeGirl! If any of you try this recipe, please let me know what you think. I'd love some feedback! Since Snickers is my favorite candy bar I feel compelled to give these a try as soon as possible. Your photos are beautiful! Thank you so much for your kind comment on my blog! Your photography is fantastic. Mmm... I love making these. I've made them w/ Mini Reese's cups too and they are great. Great idea with the Resse's! I'll have to try that. And thank you for a GREAT recipe too! I love this web site! Really fun recipe. One suggested change is to use a real vanilla bean or vanilla sugar and not vanilla extract. I get mine online at Juliet Mae Spices.It doesn't cost any more and is quite tasty. Thank-you for the comment! The vanilla bean or vanilla sugar is a nice idea. I imagine it would be great. It prints for me. Try right clicking and selecting print preview. Then just print pages 1-2 so you don't print a bunch of extra things and waste paper. PS I always have trouble with the print feature as well...not sure if it's a Firefox problem or what??? Interesting, I have no idea Jeanine. I'm using IE over here. I'm glad you said something I'll look around. The cookies looked so good that I made them yesterday. There was so much I split them into 2 portions, 1 to bring to work with me and another went to hubby's work. They were soooo good, I only managed to have ONE cookie for myself! Many thanks for sharing this recipe!!! Will certainly make it again, but is there a way to avoid having a tell-tale snickers bulge in the center of the baked cookie at the end? Hi Annabel, I'm glad you all liked them! I think you can probably try one of two things. Warm the snickers a bit, or try flattening them slightly before pressing the dough around. Maybe try both and see what works better. Before I forget to write this, I buy the Snickers when the seasonal candy comes out. They seem to be more soft and fresh and melt down better. There’s a new print button underneath the post. I hope the pages will print better now for those of you who are having difficulty. Again, thanks for letting me know. We've run some tests with Firefox and it only prints page one even with the print button. Sorry everyone, I have no idea how to solve this one! If you have any ideas please send word. Thanks! Yay Rocky I am so happy to hear that! Thank-you. These look like killer cookies and way too addictive. I also make cookies for hubby to bring to work, but I wonder what his straight-laced French colleagues would make of these oh-so American treats, so rich and gooey and yummy! Or maybe I'd have to eat them all before he could take them anyway! So, I tried these cookies with snickers and reeses. Both were amazing! I only had one problem. When I went to scoop the dough after chilled, the dough was very brittle? It just kept falling apart and I would have to hold it in my hands for a minute to warm so I could form it around the candy. What did I do wrong? If it's just a matter of being too cold, let it warm up for about 30 minutes on the counter. If the dough is too dry, break it up in a mixer bowl, add a little bit of water, and beat until just combined. Tasty little cookie. Unfortunately for me, mine didn't flatten out nearly as much as your picture (taste fine, just look kinda funny). Any idea what I messed up with that? I took the batter, fridged it for 2hrs, then rolled it out so I could ballpark about how much to get for each snicker as I don't have a scoop. Wrapped 'em up then rolled 'em in my hand for a bit to even it out. Try smashing the candy bars down a bit before pressing in the dough next time. I used really fresh ones from seasonal candy, maybe that's the difference? I just made these today for a camping trip this weekend and I can't wait to share them. I only ate one...for the taste test! I flattened the cookies after they came out of the oven b/c they looked odd. I think they look better with the ooze seeping out. Thanks for sharing this recipe! I "stumbled" on this using the website StumbleUpon. I'm in Connecticut, but I just happen to be from Moscow--very weird. Cookies look great. Wow small world! Nice to meet another Moscovite. I'd like to thank you immensely for this recipe! I made them for my boyfriend, who is away at a month-long military training/exercise camp. (He loves Snickers but they melt in hot weather and shipping.) I replaced the butter with shortening to extend the shelf-life and make them harder so they would be better for packing. I also made some that had Reese's Pieces mixed in with no Snickers inside. He JUST called me to say he received the cookies and his whole platoon loves them! You just made me and a bunch of very homesick men very very happy! The dough took a lot of getting used to, as the shortening probably changed its ability to be as flexible when wrapping around Snickers, but this recipe is definitely a keeper! Justine I am so happy to hear that!! Thank-you for letting me know. I would have LOVED it if my loved ones had made me cookies in basic or in the field. You have no idea how much you are appreciated! You might as well be Saint Justine in their eyes. Made these, only popped the dough into the freezer for 15 minutes or so, but I'm used to working quickly with hand formed cookies. As long as you're nimble, you can do it! To ensure that the dough would hold up to the cooking time prescribed, I formed a tray and popped it in the oven, then popped consecutive trays into the fridge to chill, removing one at a time as I baked. If any cookies are too "tall" simply smoosh them down a bit with the back of a spatula. Voila! Thanks for the delicious idea! I tried these using a snickerdoodle recipe I already had but next time I think I'm going to give your recipe a try. Thank-you. That was a really nice compliment. I know this is an older post but I just tried this one yesterday and they turned out perfect! I didn't have any snickers mini's but a local store was selling packages of 2 x 6 snicker bars for cheap so I bought them and cut them into quarter size pieces. I think I got about 40 cookies but I probably made them a bit bigger. What would my fitness coach have said if she knew I came home from class to make these? I am just doing everything in my will power not to eat them all at once and save them for company and some for a friend I promised them to. Thank you for sharing this recipe! I can't wait to try the rest! Candee thank-you!! I never get comments on this post anymore. You made my day! I just found this blog post and I had to leave a little comment :) I have been making these cookies for about five years and my family says I'm not allowed to attend a get-together without them! Sometimes I make the dough and let it chill overnight, then pop them in the oven the next morning. Also I always sprinkle them with powered sugar and drizzle melted semi-sweet chocolate over them.